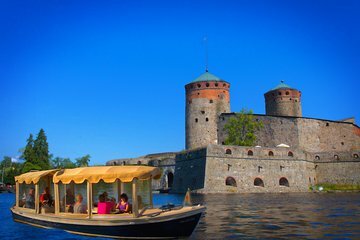 Benefit from personalized attention and an intimate atmosphere on this private cruise around Savonlinna. Rest assured that you’re booking an environmentally-friendly option with this seal-friendly electric boat. Listen to anecdotes and in-depth history from your skipper, stopping by the old castle for tea and a personal Finnish-style accordion concert. Our trip came at the end of a very pleasant few days in Savonlinna. We had introduced ourselves to the boatman at the beginning and he knew of our booking at once which filled us with confidence. His English was good and he made us feel very comfortable on his little boat. We loved the accordeon music and the light refreshment and felt it was like being welcomed into his very own home. Thought paying for the drink on top of the excursion was rather unnecessary but over all we enjoyed the trip.